How much hybridisation does machine translation need? Authors (in signing order): Ruiz, M.
Title: How much hybridisation does machine translation need? Abstract: Rule-based and corpus-based Machine Translation (MT) have coexisted for more than 20 years. Recently, boundaries between both paradigms have narrowed and hybrid approaches are gaining interest from the academic and business point of view. However, since the hybrid approaches involve the multidisciplinary interaction of linguists, computer scientists, engineers and informatics, there arise a variety of questions. While statistical methods currently dominate research work in statistical MT, most commercial MT systems are technically hybrid systems. The research community should more actively investigate the benefits and questions surrounding hybridization of MT systems. This squib discusses about different issues related to hybrid MT including the origins, the architectures, the achievements and frustrations. Understanding hybridization in the wide sense, both rule-based and corpus-based MT systems have benefited from hybridization when correctly integrated. In addition and to some extension, most of the current rule/corpus-based MT approaches are already hybrid since they tend to include some statistics/rules at some stage. 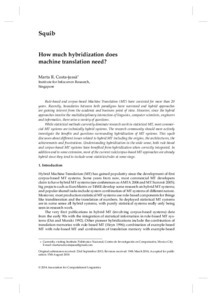 Citation: Ruiz, M. How much hybridisation does machine translation need?. "Journal of the Association for Information Science and Technology", 1 Octubre 2015, vol. 66, núm. 10, p. 2160-2165.